Congratulations to Katie Matthews on securing the publication of her final year Research Article in the Commercial Law Practitioner. 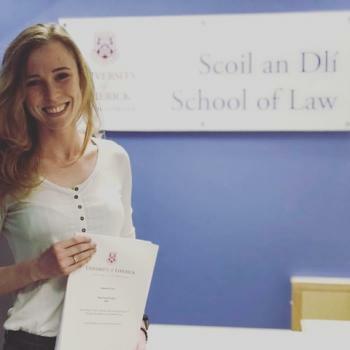 Katie’s article on the Competition Law issues raised by the use of algorithms was supervised by Ms. Sinead Eaton and is an innovative and excellent examination of the issues. Fittingly, Katie has been offered a Traineeship at Allen & Overy, Solicitors in London. She is one of only four trainees on an Advanced Delivery Traineeship. This is a new and specialised traineeship focussing on Legal Technology and Project Management. Sinead and her colleagues at the School of Law are delighted by this success.